Brisbane - Cricket Australia team performance manager Pat Howard says all-rounder Shane Watson's calf injury and resulting inability to bowl is adding to the selection issues for the second test against South Africa in Adelaide beginning November 22. Howard said Wednesday that the national selection panel wants the Australian vice-captain to prove his fitness to play as an allrounder, indicating they're unlikely to consider him solely as a batsman for the second of three Tests. The first Test ended in a draw at the Gabba in Brisbane on Tuesday. 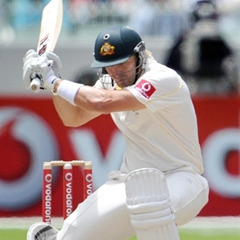 Watson was replaced in the Brisbane Test by left-hander Rob Quiney, who was forced to bowl seven overs of his part-time medium pace to help Australia get through the overs as South Africa made 450 in its first innings of the rain-affected match.